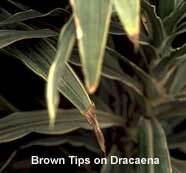 Careful Fertilizing House Plants Can Lead to Possible Brown Tips & Root Rot! Tags on plants can be confusing… If you follow the directions on the tag. What does “Fertilize Regularly” mean? Fertilizers – Watch Out – Salts Burn! Fertilizers are basically salts. When fertilizing potted houseplants you are putting salts in the pot. If these salts stay in the pot and are not leached out by thorough watering, the salts build up and burn the roots which can lead to brown tips. Most houseplant fertilizer comes in liquid form. If you insist on fertilizing indoor plants – Cut the Dose. The question is: How much fertilizer to use? You would probably cut the recommended fertilizer rate of 1 teaspoon per gallon to 1/5 or 1/6 of a teaspoon per gallon. To remove the salts from the soil the media must be leached by adding more water. Overwatering is already one of the biggest problems with indoor houseplant care! This only creates more problems or potential plant issues like rotted roots, brown tips and possible death. Fertilizing outdoor or patio plants is another issue altogether. I have a beautiful peace lily in a two gallon container. It’s sitting in front of a window, but the light is indirect due to a covered porch in front of the window and large trees providing much shade. The bottom leaves are turning yellow and brown. I received the plant on Mother’s Day, so it is about two months. I am watering once a week with approximately 4 cups water. The plant has eight flowers at this time. Am I watering too much? Is the chlorine in the water hurting the plant? Can you give me some insight, please. If you use an organic fertilizer, you have no problems with salt as they don’t contain salt. Use Dr. Earth or Neptune’s Harvest, you’ll not have any problems with fertilizing.